Hippocrates is credited with saying, “Let food be thy medicine and medicine be thy food.” Although important throughout the life span, nutrition is foundational for healthy aging. Consequences of inadequate nutrition include decreased immune function, poor skin integrity, and loss of independence. Physiological and psychosocial barriers to good nutrition tend to arise with advancing age. Polypharmacy can also increase nutritional risk with the potential for food-drug interactions and unintended side effects. Although energy needs decline with age, requirements for certain nutrients such as protein and vitamin D increase, making a nutrient-dense diet even more important. Yet, an increasing percentage of seniors are overweight and undernourished. Most adults over age 65 have at least one nutrition-related chronic disease; among the most common are type 2 diabetes, hypertension, atherosclerotic cardiovascular disease, or a combination of these. While overly restrictive diets are contraindicated, healthy eating patterns underpin both primary and secondary prevention of these chronic conditions. In addition to physical health, food and diet affect quality of life and cultural expression. 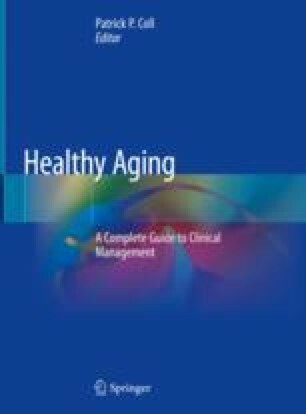 Thus, strategies to ensure nutritional adequacy promote both physical and psychosocial aspects of healthy aging. United States Department of Agriculture. DRI tables and application reports: National Academies Press. 2018. Available from: https://www.nal.usda.gov/fnic/dri-tables-and-application-reports. National Institute of Diabetes and Digestive and Kidney Diseases. Prescription medications to treat overweight and obesity. National Institutes of Health: 2018 [Available from: https://www.niddk.nih.gov/health-information/weight-management/prescription-medications-treat-overweight-obesity. United States Department of Agriculture. 2015 – 2020 Dietary guidelines for Americans. 8th ed. 2015. Available from: https://health.gov/dietaryguidelines/2015/guidelines/. American Heart Association. Fish and Omega-3 Fatty. 2017. Available from: https://healthyforgood.heart.org/Eat-smart/Articles/Fish-and-Omega-3-Fatty-Acids.